Firstly with wiring it up, there is a power wire which needs to be connected to a 12v power source that is switched through ignition. I'm wondering where/what original wire currently in the car I could splice this into? 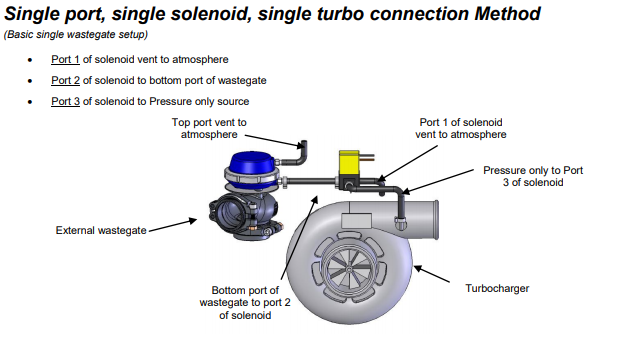 Secondly regarding the plumbing of the solenoid, the picture below shows how to run the hoses to and from the solenoid. I am wondering whether the 'Pressure only to port 3 of solenoid' hose can be ran from the inlet manifold rather than the turbo housing? I ask as I don't have a fitting coming off of the housing. If I can't run the hose from the inlet manifold and instead have to drill and tap the turbo front housing to run it from there then so be it, but I'd rather avoid having to take that off if I can get away with it. I'm sure I'm not the first person who has fitted one of these boost controllers to a VL so any help would be greatly appreciated! Also, if anyone has some suggestions on a subtle place to mount it, that'd be great. Cheers! It's been years since i installed mine so can't remember which wire i used tbh, as for the presure line i would deffinatley drill and tap into the compressor housing, too much of a risk if you take it from the manifold.. Thanks for the reply mate, I appreciate it. No worries about the pressure line.. after doing some more research that seems to be the go! If by any chance you remember what wire you used, if you could let me know that'd be great. Also, where do you have your boost controller mounted? All times are GMT +10. The time now is 21:57.